The toucan is a bird from the family Ramphastidae. There are around forty different species of toucans and five genera. They range in color and size but all have the distinguishing large beak that sets them apart from other birds. Toucans are not related to parrots but are distantly related to woodpeckers and barbets. They live in tropical and sub-tropical environments. The bright colored beak of the toucan is usually seven to eight inches long and is the most notable feature of the bird. The bill looks as if it would be heavy but is actually quite light. It’s made of keratin which is the same material as fingernails and it is built around a frame of thin bones. It also has large pockets of air. The bill can be green, blue, red, white, yellow, black or brown and is often in a variety of colors. Toucans have compact bodies, small wings, and short necks. Their legs are short and strong with the two outer toes backwards and the middle toes forward. This aids them in being able to hold on to branches securely. There is little color difference between the male and female toucan but the female is often smaller in size. They have a long tongue, around six inches long, that is extremely agile and sensitive. An unusual aspect of the toucan is that their tail feathers are attached to the spine with a ball and socket joint. This allows them to bend their tail feathers forward which is how they sleep. A full grown toucan is from around seven to twenty-five inches tall depending on the species. The toucan eats a diet that consists mostly of fruit. They will eat other foods when it’s available including lizards, insects, young birds and eggs. They use their bill to reach for food and to shell and peel what they eat. They then toss it into their mouth. Toucans live in small flocks of five or six birds. Eggs are laid usually once or twice a year in a nest in a tree. The eggs are bright white and take about eighteen days before they hatch. Two to four eggs are usually laid at one time. When the chicks hatch their beaks are small and they have no feathers. Both parents stay and take care of the eggs until they hatch and then care for the young chicks. They stay with their parents for several months until their beaks have grown and they can take care of their selves. Toucans live mostly in Central and South American. Their main habitat is the rain forest. They live in the top layer of the trees called the canopy. They make their nests in holes in trees that have been made by other animals, often a woodpecker. 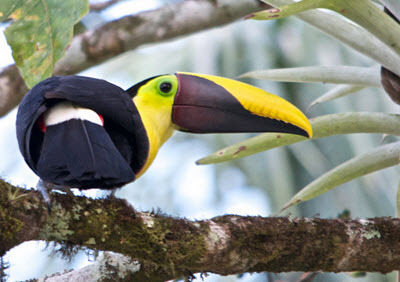 The toucan’s large bill cannot hollow out holes in trees so they must find the hollows. Though toucans can fly short distances they rarely do and then it’s more like a glide. They spend most of their time hopping from one tree to the next since where they live is densely forested. They live an average of twenty years in the wild. 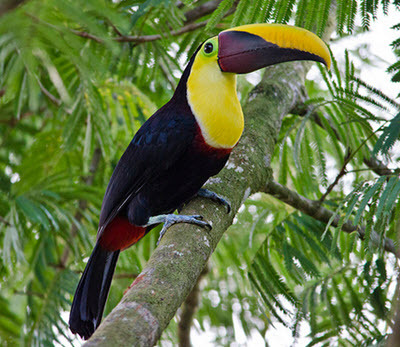 Toucans have a wide variety of predators including larger birds, wild cats, and humans. Their large bill is not helpful as a weapon but does help intimidate predators by its large size. The toucan eggs are often eaten by snakes and rats. 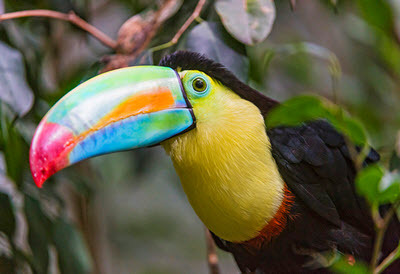 The toucan is not an endangered species, but like other animals that live in the rain forest, its existence will eventually be threatened if the rain forest is not protected. Toucans often suffer from an iron storage disease. Toucan Sam, a cartoon toucan, has been the symbol for Froot Loops cereal since the 1960s. An appropriate choice considering that toucans eat a diet mainly consisting of fruit. His brightly colored beak has made the toucan a well-known and popular icon. Guinness beer featured a toucan in their advertisements in the 30s and 40s. Many people enjoy owning toucans as pets due to their intelligence and unique appearance. But they are a high needs pet so you must think your decision through before purchasing or adopting a toucan. They can also be very sensitive if they don’t get the right diet. These birds need a lot of attention. Owners spend several hours a day working and playing with their toucans. Be sure you have that kind of time to invest in a pet. Unlike a dog that’s been domesticated for a long time, toucans have only recently been captured and bred as pets. They still maintain the spirit they had in the wild. Toucan are messy. The larger they are the bigger mess they’ll make. They throw food around and chew on furniture. They poop a lot and everywhere. They’ll also swallow small objects so you’ll need to keep your house free of anything like tiny screws or small toys which can be fatal to your toucan if ingested. Unlike a cockatoo or other parrot, a toucan cannot be taught to talk. They can learn a variety of tricks but training them can be a chore. Though they are intelligent they have short attention spans. Teaching them will require endless patience on your part. Remember, when you decide to take a vacation you might have a hard time finding a pet sitter. Though your friends might be willing to come over and feed and walk your dog, they might not be willing to spend hours entertaining your toucan or dicing their meals of fresh fruit. Be sure you have a plan for these scenarios. Cost should also be considered. Purchasing a toucan can often run thousands of dollars but that’s only the start of the expense. Toucans do best in large spaces such as aviaries with a wide array of toys to amuse them. They’ll also need visits to an avian veterinarian. Toucans mostly eat fruit and cannot be fed frozen or canned varieties. This means fresh fruit that has been diced for them is a daily concern. Their favorites being exotic (and costly) choices such as mangos. They should not be fed too many citrus fruits. Many toucans suffer from an iron storage disease called hemochromatosis. This means special care must be taken with their diet. They can’t eat bird seed or pellets designed for other birds. A toucan can live up to twenty-five years in captivity so it is not a short-term commitment. Despite the challenges, many people enjoy their pet toucans, and wouldn’t trade them for anything. When purchasing a toucan always buy from a reputable breeder or rescue organization. You want to be sure your bird was not captured in the wild.